If there’s one actor who epitomizes the “man’s man” in film, it would have to be Charlton Heston. He’s gruff, he’s powerful, he really likes guns. No pansy roles for this man. In fact, it almost seems like most roles were just excuses for him to be on screen without his shirt. While he did occasionally play some normal roles (like Brad Braden in The Greatest Show on Earth (1952)), there were two distinct genres he truly excelled in. One was the Biblical epic and the other was science fiction. In the former, he was a commanding presence and usually played very powerful and influential characters. In the latter, he was just trying to survive, but also trying to figure out his situation in the process. Even if some of his science fiction work has been remade in recent years, Heston remains the iconic actor for these roles. This week’s two movies examine two strengths of Charlton Heston’s acting career. When one thinks of Biblical epics, they often think of Charlton Heston. This is probably because of the two most-famous Biblical epics, The Ten Commandments (1956) and Ben-Hur (1959) both star Charlton Heston. If anything, The Ten Commandments prepared him for his single Oscar-winning role in Ben-Hur. Or, at least it made people pay attention to this actor on the rise. And while some of his other roles weren’t necessarily Biblical, he did tend to play other historical figures like Michelangelo in The Agony and the Ecstasy (1965) successfully. Of course, one of the problems of having such a manly man as your lead role is that, when the scene requires crying, Charlton Heston allegedly couldn’t pull it off. Considering that he learned to ride chariots for his roles more than makes up for this acting limitation. A few decades after the transition from B.C. to A.D., Jerusalem is oppressed under the Romans. And while the wealthy merchant, Judah Ben-Hur (Charlton Heston), doesn’t necessarily mind, he’s still not going to help the Romans with finding anyone who dissents against this style of government. Yet, Messala (Stephen Boyd) wants to get on the Romans’ good side and uses an incident outside Ben-Hur’s house that eventually leads to Ben-Hur’s enslavement. From this point onward, Ben-Hur is obsessed with revenge against Messala. 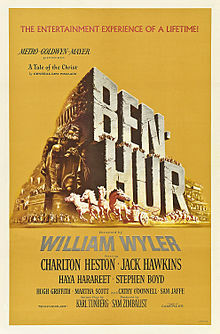 Through a series of blessed events, Ben-Hur soon becomes a free man and returns to Jerusalem to exact his vengeance. However, he’s in luck because Messala is in a chariot race and Ben-Hur has used some of his time after being freed to become an excellent charioteer. Another genre that Charlton Heston did well with was science fiction. Among films like The Omega Man (1971) and Soylent Green (1973), Heston could excel with his gritty voice and rugged appearance. This also remains true with the 1968 classic, Planet of the Apes. A scraggly man, just trying to survive on unfamiliar territory was Heston’s bread and butter. And while many of his most quoted lines came from his Biblical epics, he still had quite a few good ones in his sci-fi films, most notably, “Take your stinking paws off me, you damned dirty ape!” There was kind of a raw, primal anger that seemed to fuel a lot of Heston’s roles. When you consider the survival aspect of many of them, it seems like quite the justified attitude, based on the character’s predicaments. George Taylor (Charlton Heston) is an astronaut on a mission. Unfortunately, the mission’s prime directives are soon abandoned when he and his crew crash land on a strange and unfamiliar planet. Soon they find that the dominant species of this planet are the Apes, which goes against everything they ever knew back on Earth. 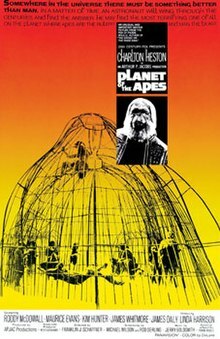 Through poking and prodding, the Apes examine George as if he were some sort of lab animal because he can talk (a trait not common among the men they experiment on). Eventually and reluctantly, the Apes let George go, along with one of the women they have captured. They send him out to find his destiny, which is undoubtedly to figure out where he is and how he can get back to Earth. But with a twist ending, this destiny may be easier than he thought.